Are you getting the proper nutrition!? Juice plus offers an assortment of bars and powders to supplement the basic daily supplements. For most folks, NO!! Even for those of us that try we are fighting a losing battle! Between the convenience of fast food, allure of sugary treats, decreased nutrition content in foods and just plain not knowing; it's not easy to get a good daily amount of nutritious food to balance out things. The food pyramid we grew up with is outdated and was inaccurate from the start, but its what everyone knows. In all honesty our diets should shift focus to more leafy greens and other vegetables with as much variety as possible. Not to say anybody should become a vegetarian but rather shift from a mostly carnivorous diet (I know I know, meat just tastes SO GOOD!!) to one that is 60-80% vegetables with another 5-10% fruits. This diet would decrease the acidity of the tissues, an environment conducive to the growth and development of cancers, keeps the digestive systems (small and large intestines) clear of debris and helps prevent large fluctuations in blood glucose levels (regular large swings or constant high levels lead to type 2 diabetes). Just a few of the major benefits of supplementing your daily diet with Juice Plus products. So yeah that sounds all fine and dandy, whats the cons? Every side has a bad side. Easy, due to recent developments in production technology and increased demands for food (across the world) food quality has decreased. This translates to good looking but less nutritious food. Even the produce you find in the big "organic" food stores has a decreased nutritional content, compared to 50 years ago. "So whats the point of trying" you might ask!?! Its always worth the effort! Even a less effective salad is better for your health than a Big Mac or Whopper!! Here's the kicker..... Whole food supplementation. 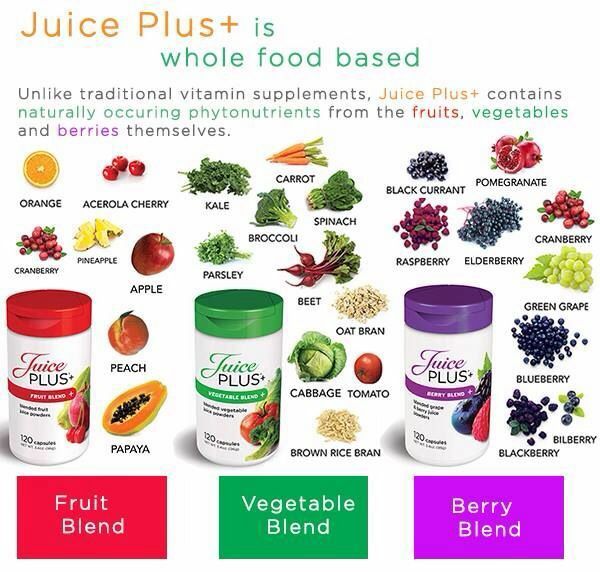 Companies like Juice Plus are taking whole fruits and vegetables and reducing the best parts to a powder to taken in a pill form taken daily. 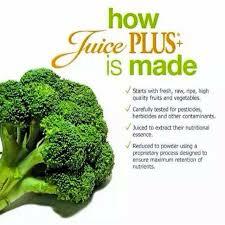 Juice plus is the most researched dietary supplement on the market. More than 20 major medical journals or magazines have conducted studies on the effect of the juice plus products, including children, adults and seniors. A couple big benefits are improved heart health (arterial elasticity, decreased plasma homocystiene levels, reduced systemic blood pressure, reduced oxidative stress to name a few), increased bioavailability of nutrients, improved immune function, dental health, skin health, reduce systematic inflammation and overall quality of life. Whats the chances you get all this nutrition on a weekly basis. With this product you get it DAILY! If you're tired of feeling tired, sick and overall just less energetic than you used to then I would recommend you look into this amazing product. You can contact either the company or myself for more information or to get started. In the long run this is something you can't afford to miss out on. Oh and if you're curious on the cost..... It works out to cost less than $2.50 per day for the recommended dosage. What price would you put on your health? Doubt it would be so affordable! !